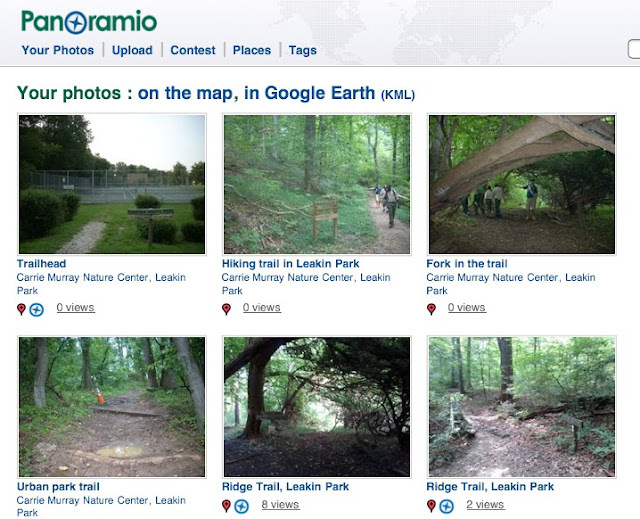 On Saturday August 13, I went with other OA members to the Carrie Murray Nature Center in Leakin Park. The weather mostly cooperated, as we had a lot of outdoor program for the Scouts who attended, but a bit of rain later in the day pushed us inside to the classroom. 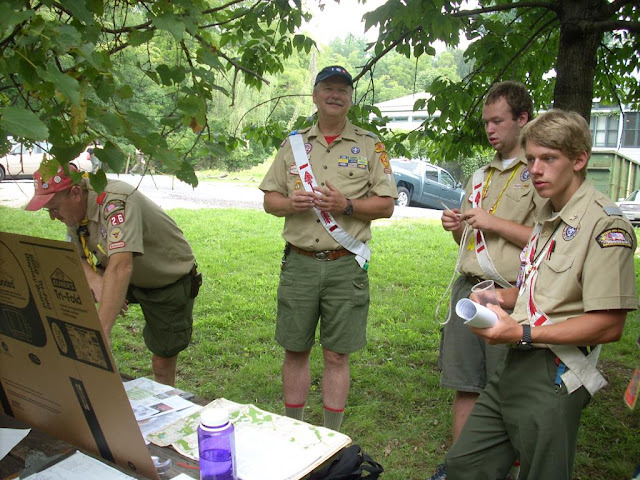 Planning for the event had been tricky, as most Scout units do long term camping in June, July or August, and the OA national event SummitCorps also took a week out of the schedule, not to mention the planning time for it. 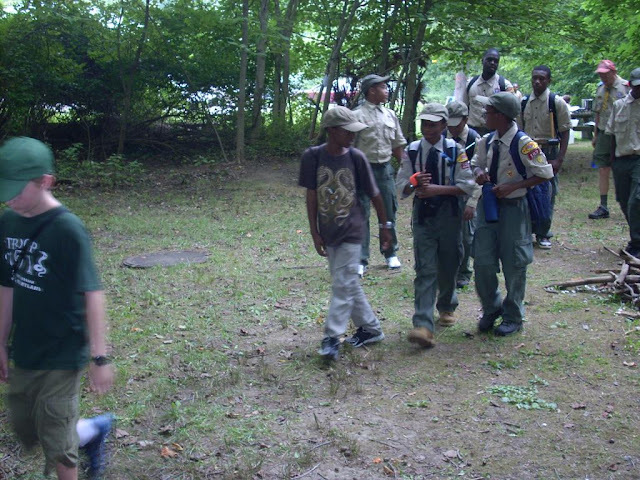 Different stations had been proposed for the Expo in the city, and we ended up with Cooking, Camping Promotions, Leave No Trace, Pioneering, and my station on the Baltimore Historical Trails. During a planning meeting the week before the event, I got a chance to check out the Nature Center and the surrounding woods, including taking a hike for about 45 minutes. There is a lot to see in the area, and while the trails are well-worn, there has been serious attention paid to maintaining them. 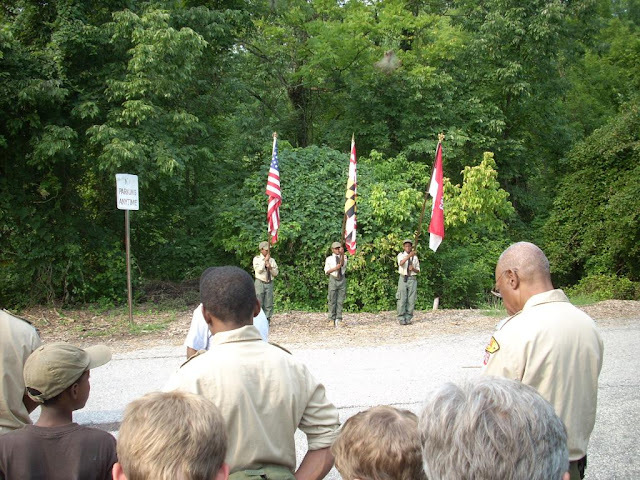 Photo 1 - the day's activities started with an opening ceremony by several Boy Scouts. 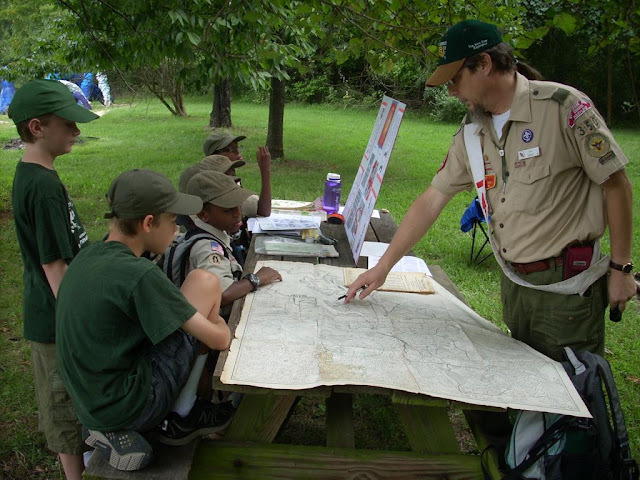 Photo 2 - The Scouts learned about the Baltimore Historical Trails and patches, but seemed just as interested in a map of the city from the 1950s. "You are here!" Photo 3 - what would a Scout activity be without food? Joe Spellman cooked up the hot dogs. Photo 4 - Nentico Lodge Chief Ryan Kivinski led the Scouts on a hike, passing by historic artifacts and the Orianda House in Leakin Park. It's a big park, but because we had a map, we did not get lost. No, really. 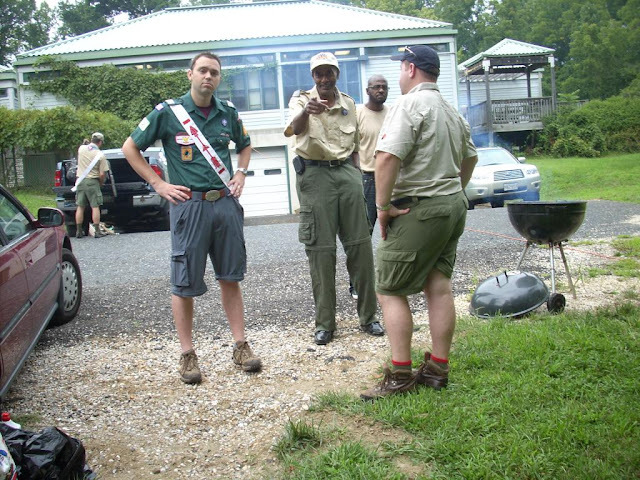 Photo 5 - Lodge Adviser Mike Parrish, Lodge Vice Chief Zach Dowell, and Lodge Chief Ryan Kivinski, left to right. Photo 6 - the trail back to the parking lot by the tennis courts (Eagle Drive!). After the rain, note the puddle behind the water bar. A few of these need to have grade changes to the drainage goes off the trail. Photo 7 - Photo mapping, afterwards, trying to get pictures into Google Earth. The pictures in the top row middle and right were rejected since they have too many "people" in them. The middle one I was able to crop and have accepted later. 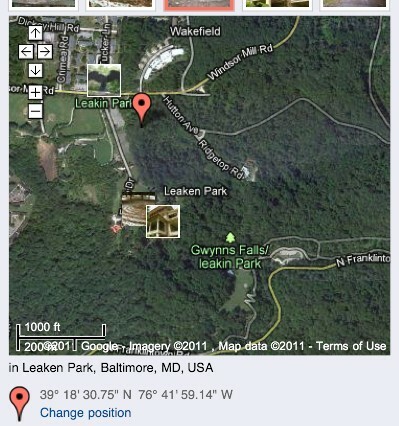 Photo 8 - A screenshot from Google Maps, showing the expanse of trees in this park. Anyone notice the typo? Till the next Scout event in the park!